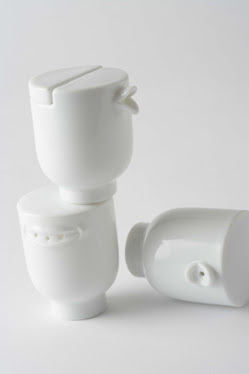 For these soy sauce, salt, and pepper containers, nendo decided to differentiate between the three through a combination of sight and sound, or words as sound. Instead of relying on symbols and letters, the mouth of each container is the shape that a human mouth would make when saying the name of each product: "yu" for "shoyu", which means "soy sauce" in　Japanese, “shi” for “shio”, which means salt, and "ko" for "kosho", which means "pepper". In an age when we rely increasingly on e-mail for communication, and conversation fades from the dinner table, "talking" subtly links people and things through the power of the texture and sound of spoken Japanese.